I love breakfast casseroles and crustless quiches but I rarely make them for breakfast. I don't want to cook something that time consuming in the morning when I have to be out the door at 7:40 with 3 kids in tow. Since I'm unwilling to make them for breakfast, I make them for dinner. Or brinner as it is referred to in my house. 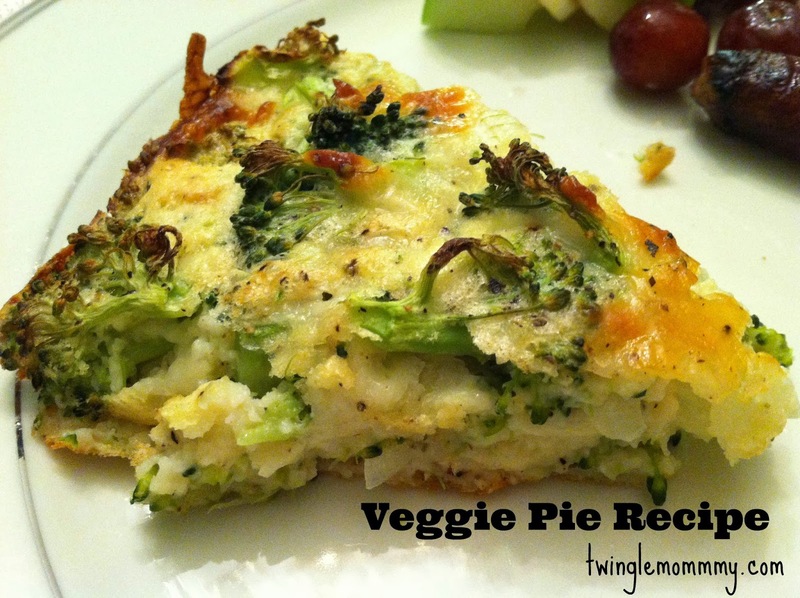 I love this Veggie Pie! It is so versatile and you can change it up to use your family's favorite veggies. I got this recipe from Betty Crocker. I only made a few slight variations so you can go to their website to see the original. I will say that my recipe is faster than theirs. On a busy night, faster is always better right? 3. In a large bowl whisk 2 eggs. 4. Slowly add milk to egg mixture. Once that is combined, slowly add the Bisquick and whisk until there are no lumps. 5. Stir in remaining ingredients into the egg mixture. 6. Pour into a greased pie plate and bake in the oven for 35 minutes. 7. Cool for 5 minutes and serve. I have made this veggie pie for 3 years now and it can be changed to add in meat or use different vegetables. I've added bell peppers with the broccoli which I loved. I've also done it with just ham and cheese and omitted the veggies all together. I love a recipe that you can play around with. Another thing I love about this recipe is that I always have these ingredients on hand. Don't you just love a quick dinner that you can whip up when you haven't gone grocery shopping? OOOhhhhh That Veggie Pie sounds tasty. Bookmarking this page for another day! I have to try that resurrection bread- thanks! I may have to try this next Monday. Right now, we do Meatball Mondays, but I really need some variety!